It’s no secret that I’ve never really found my full-time job fulfilling. In fact, that’s why I decided to try my hand at freelance writing for blogs last year. At that time, I had no plans to make freelance writing my full-time job. In fact, I didn’t see it or even treat it as a business until one my first clients turned best-online-friend, Cat @ Budget Blonde, took the time to ask me what my goals were “for my business”. Until she asked me that, I never thought of it as a business. I simply saw it as a way to bring in a few extra dollars to put toward my debt. After that first conversation with Cat, my viewpoint began to change. I realized that I had the potential to make this online business so much more than just a way to bring in a couple hundred dollars each month, especially with Cat’s help. That’s when I started to pursue more writing and VA jobs and research more about how to make my business legitimate. I started freelancing last July and after 1 year and 2 weeks, I’ve decided to quit my job and make my online business my full-time job. My last day at my full-time job is today, July 31, 2015! When I first turned in my notice to quit my job on July 1, I was so excited and very nervous. 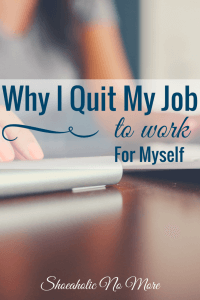 I’ve never really quit a job before and I was worried about what the reactions of my co-workers, bosses, friends, and family would be. Overall, they were very positive. Many of my co-workers said they were excited for me when I told them I would be running my own business. A few even said they were kind of jealous of my courage to take the leap into self-employment. There was one co-worker in particular that I was worried about and she had a very positive reaction, which I was grateful for. When I told my dad I had quit my job, the first thing he said was “How are you going to pay for health insurance and save for retirement?” He was concerned that I hadn’t thought those things through – but I have and after we discussed my plans for those logistics he was very excited for me. My dad is the person I look to most in life for advice and he’s one of my best friends, so his reaction was very important to me. My grandma has absolutely no knowledge of how things work with online businesses, which I’m sure is generational, so she expressed concern and worry. I tried not to let it get me down, but it did plant a small seed of doubt in my mind. But after talking to more people in my life, that feeling has mostly subsided. Since I’m a planner by nature, I have some plans in place already for how I’m going to run my business full-time starting next week. I have big plans, ideas, and goals that I haven’t had time to implement in the past few months between working my full-time job and running my business in the evenings and weekends. I’m hoping to have more time to implement some of these “big picture” ideas to help my business grow. Of course, I want to keep my clients happy and I love working with them, learning from them, and seeing them succeed, but now I’m ready for some of that for myself too. I might look for one or two more clients to help me feel a little more secure about my monthly earnings, but for the most part I’m not going to try to grow my business a ton in my first month of self-employment. Instead, I want to focus more on my current clients and on my own brand too. I can’t help but think I’ve quit at almost the perfect time of year – right before things pick up in the fall (freelance work is usually busier in the fall than the summer), and right before FinCon! I definitely plan to make the most out of my time at FinCon by networking and treating it as a business trip, not a vacation. But that doesn’t mean I don’t want to have a little fun while I’m there too. I’d also love to meet up with some of you. So if you are going to FinCon and you’d like to meet in person, give me a shout! As things progress with my self-employment in the next few weeks and the next few months, I’ll be sure to fill you in on what works for me and my business and what doesn’t. Because I know at least a few of you are hoping to make the leap to self-employment in the future too. Anything we can learn from each other will help us all succeed. Overall, I’m excited and only a little nervous about the fact that I quit my job and am taking the leap into self-employment. I still have debt to pay off and my progress might be a little slower (at least for a while), but I know I can get there with my work ethic and drive. I’m so excited to see what life throws at me next – I never expected to someday be rocking the boat and taking the leap into self-employment. But I can’t wait to see what comes next! Thanks Kristi! I can’t wait to meet you too. FinCon is going to be awesome!! Wow! Congrats and looking forward to following your journey! Thanks Katie! I’m super excited about it. That’s super exciting Kayla. Huge congrats 😉 I’m sure things will work out great for you! Huge KUDOS! Way to do something crazy and big. I can hear the excitement in your words. I feel like I’m on the cusp of doing what you’re doing, so keep leading the way. You’re shining a light for the rest of us to follow! Thanks Laura! I appreciate the kind words. Yep – it feels like “finally” lol. Balancing my FT job and my freelance business for 1 year was tough! Congratulations! I’m sure you are going to rock it! You will rock this! Sending good vibes your way. I’m so happy for you! Can’t wait to hear your updates. I’m super excited about it Tre. I’ll definitely give some updates. That’s awesome! Congrats on taking such a huge step. I can’t wait to read your updates on this amazing adventure your taking. Hooray! So proud of you, Kayla! I wish you the best. You definitely have the drive! Good luck Kayla! I am impressed with people who quit their job for self-employment. Hope to hear a good success story. May the odds be ever in your favor. haha, thanks for the Hunger Games reference Jayson! Congrats! I just high fived my computer screen ha! You are going to do great! Congratulations on taking the leap! I’m so excited for you, Kayla. I know how hard you worked to make this happen and you’re going to do great! Congratulations and welcome to self-employment! Congrats on your big move into self-employment! I know you will continue to have great success. It’s been so great to watch your journey, Kayla! I’m very proud of you. I think you’ll learn to love being your own boss. Holler if you need anything and of course I’ll see you at FinCon! Congrats on making the leap Kayla! I’m so happy for you and I know you’ll do great being able to focus on your business more 🙂 Balancing a full-time job, clients and trying to establish your own brand is tough but I see it at only temporary for myself as well. It is really scary, but so far it seems to be totally worth it!